Your love of pirates does not have to stop at costuming and pirate gatherings. No, you can also do some decorating with our pirate statues and collectibles! 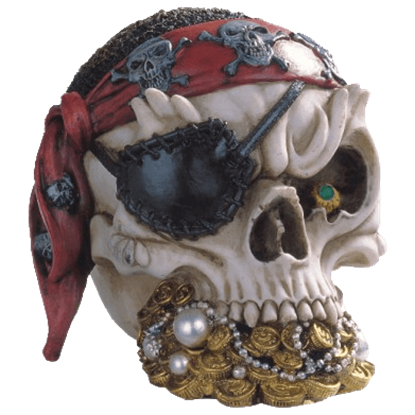 From pirate skeletons to pirate captains, and in all different sizes, we offer a huge variety of pirate collectibles and home decor perfect for giving you a way to bring a genuine pirate from the Golden Age of Piracy into your home. Some of our pirate statues are based on historical figures, recreating the looks of such famous pirates as Blackbeard, Henry Every, Calico Jack Rackham and more, while others recreate pirates from history, lore, and fiction, like Davy Jones or Captain Sparrow. Others depict living pirates, showing the swashbucklers as they guard their plunder or fight in battle. Still some of our pirate decor reveals grinning undead pirates, skeletal things that continue to plunder and pillage even after they have done to their grave. Also to be found here are treasure chest trinket boxes, modeled and scaled down from the containers that pirates used to store their plunder. 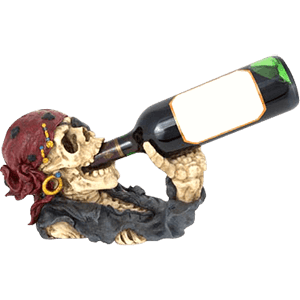 Pirate miniatures, pirate wall signs and plaques, and pirate drinkware can be found here too, depicting skulls, crossed swords, and Jolly Rogers. Here we carry all manner of sculpted pirate decor, making it THE place to come when you want to add some pirate style anywhere. If you have ever dreamed of sailing the seas and keeping the company of swashbuckling scallywags during the Golden Age of Piracy, our selection of pirate statues is perfect for you. We offer a wide range of pirate statues here, from stately cast bronze pirate statues to fun pirate bobbleheads, all perfect for embracing and showing off your love for all things pirate. We offer pirate statues inspired by historical pirates of old as well as unique pirate skeleton statues. You may also find a selection of lady pirate statues here, as there were a number of famous female pirates throughout history and legend. Decorate your shelves and tables with these pirate statues, fit for creating a collection or displaying on their own as unique conversation pieces or as ways to bring personality to your workspace. Avast! If you have been yearning to decorate your home or office in the way of the pirate, our pirate home decor and gifts section is the place to find everything you need! 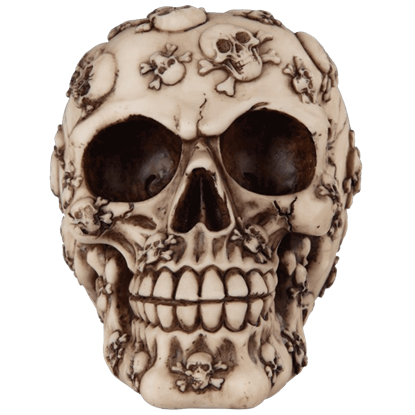 We offer a wide variety of home decor items all decorated or shaped like pirates or pirate symbols, such as our pirate wine table or pirate skull bookends. We offer pirate coasters, pirate ashtrays, and pirate incense burners that are sure to look great on your coffee table but would also look quite nice on our pirate tables! Our pirate tankards and pirate wine bottle holders are great additions to kitchen and party displays. Many of our pirate home decor pieces are painted by hand to reveal excellent details, and many are accented with iconic pirate imagery, such as skulls, pistols, and cutlasses. No matter where you wish to decorate with pirate style, we have a piece for you here in our pirate home decor collection. 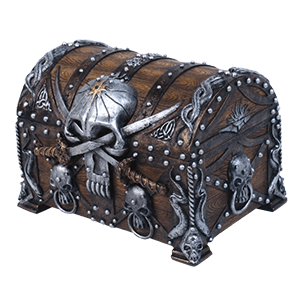 Keep your small treasures safe in the same way as pirates of old when you store them in our pirate trinket boxes! These pirate boxes are ideal for storing jewelry, coins, small keepsakes, and all manner of treasure you deem fit to trust to these treasure chest trinket boxes. Many of our pirate trinket boxes are in fact shaped like pirate treasure chests and are often decorated with pirate skulls, skulls and crossbones, or even ocean beasts from the deep. 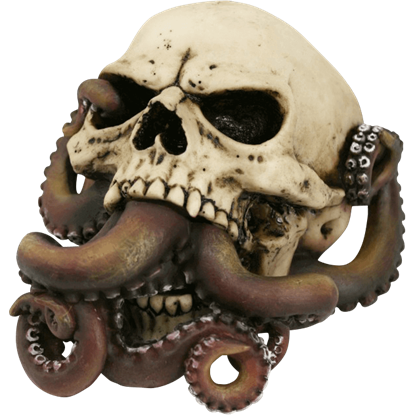 We offer octopus pirate chest trinket boxes and kraken trinket boxes both in this category, their fantastically detailed forms perfect for keeping guard over your treasure. Our pirate trinket boxes are great for keeping your jewelry sorted. They also make fun and fitting storage containers for pirate coins, collectible coins, and gaming coins. No matter what you choose to store in them, you will feel just like a crafty pirate captain when you do so! Pirates were not the nicest of folk, and the Gothic Pirate Skull seems to have retained its surly attitude even after death. It has not lost its sense of style, though, judging from its black bandana and sleek pirate coin piercing. It goes without saying that if pirates could, they would take their ill-gotten booty with them to the grave. It looks like that is exactly what the Pirates Treasure Skull has done, as this skull sits on a large pile of treasure. When choosing the proper decor to adorn the cabin, why should the proud pirate rogue settle for a plain skull? The Tattooed Buccaneer Skull proves that a pirate skull looks so much better with the Jolly Roger adorning it. Not every corpse that gets lost at sea is lost forever. Sometimes, something else finds them. The Underwater Skull shows you just what happens when a smart little cephalopod discovers a human head and decides to make its home there.